"My mother-in-law gave me this recipe. She always used lard and I found it easier to work with than vegetable shortening." 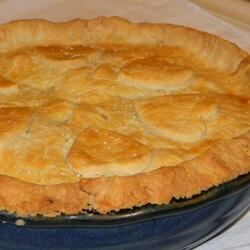 I tried this recipe with the fresh rhubarb pie recipe on this site and I didn't think it tasted very good. I don't think that I liked using the lard. Will go back to my old pie crust recipe. Truly the best-ever flaky piecrust! My grandmother back in Iowa summers used to make this crust for all her pies and they were the very best pies ever.The lard adds a wonderful oldtime taste. I HAVE NEVER BEEN ABLE TO ROLL A CRUST UNTIL THIS RECIPE. CRUST IS EASY FLAKY AND TASTE GREAT.